Habit: Annual. Stem: 5--30 cm. Leaf: 5--55 mm; lobes 2--7, +- glabrous to woolly. 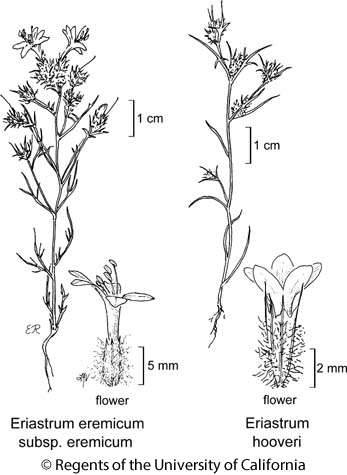 Flower: corolla 11--18 mm, generally bilateral, tube 4--9 mm, blue or yellow, throat 3--3.5 mm, generally yellow, lobes 4--8 mm, light to dark blue, sinuses unequal; stamens attached in upper tube or lower throat, 2--9 mm, generally unequal, bent toward lower corolla lip, exserted. Chromosomes: 2n=14. Ecology: Open areas in sandy soils; Elevation: < 1800 m. Bioregional Distribution: SNE, D; Distribution Outside California: to Utah, Arizona. Flowering Time: Apr--Jun Note: Other subsp. in Arizona. Unabridged Note: Eriastrum eremicum subsp. yageri (M.E. Jones) H. Mason in Arizona. Citation for this treatment: Sarah De Groot, David Gowen & Robert Patterson 2015, Eriastrum eremicum subsp. eremicum, in Jepson Flora Project (eds.) Jepson eFlora, Revision 3, http://ucjeps.berkeley.edu/eflora/eflora_display.php?tid=50335, accessed on April 20, 2019.